"The cumulative structure of the course was right on. 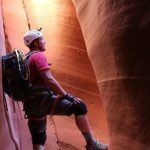 We had three opportunities to learn each technique - classroom (camp), controlled situation (bridge), then actual application in the canyons." "Just wanted to drop you a quick note to let you know that I really enjoyed your course. Thanks for your patience. You are a great teacher. I have found in the past that just because one has the knowledge on something, doesn't mean they have the ability to convey that information to others in a way they can retain it. You actually have the gift. I know I retained more that I thought I would. It was a pleasure spending those three days under your guidance." "I had a great time in this class even though I missed some of it. Rich you're a great teacher you know how to make it fun."